It has three luxurious king-size bedrooms and three gorgeously decorated bathrooms. The vaulted ceilings and an abundance of windows give an open and airy tropical feeling with plenty of natural light. 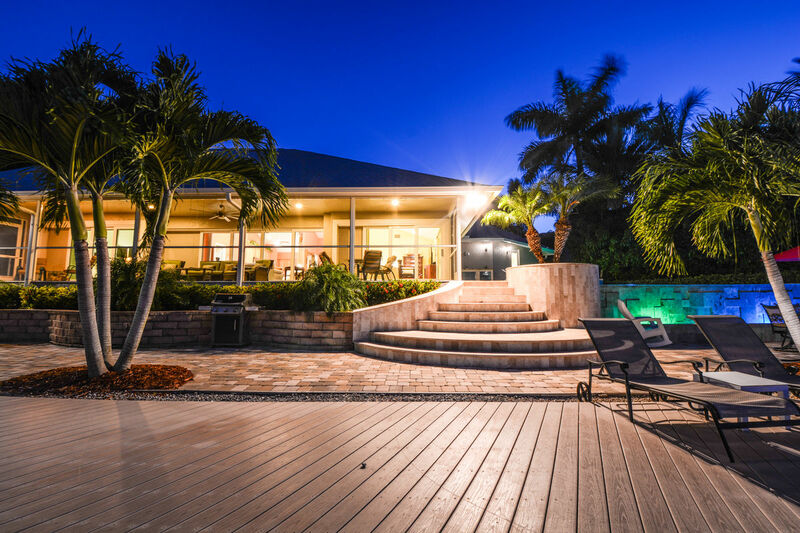 The home has an impressive lanai with plenty of seating to treasure a cocktail as the sun sets. You'll be amazed by the prestigious infinity pool with falling water. It has a spa and a spacious sun deck area with plenty of lounge chairs and outdoor tables room for everyone. What a great place to host family and friends or just spend the day lounging in the sun. The dock is prepared for your family to explore the waters with plenty of room to tie a boat to, don’t forget your fishing poles! The kitchen has been recently remodeled with stainless steel appliances, exotic wooden cabinets and marble countertops that open up into the immense living room with a 60' flat screen TV. What a great place to create delicious meals and still enjoy family time. Another unique feature about this home is each bedroom offers a king size bed and beautiful bathroom giving you a pampered feel everywhere you go. Please also check out our video tour. The video tour give you a great opportunity to walk through the house and get a feeling for this beautiful property. We prefer rentals from Saturday to Saturday. Please call or email us if you have different dates and we will see if we can accommodate you. Great house with awesome pool!!! Stayed for 9 days over Christmas. House was very nice, pool was great. Fishing off the dock was a blast. Caught fish everyday. Kids loved the fishing and pool. Believe we were the first to rent and had a few minor issues with the pool heat but issues were addressed. Would rent this house again!! I believe we were the 2nd renters in this home. We arrived the week after Christmas. The outdoor area of this home is incredible. We have 3 children and they swam in the pool and enjoyed the hot tub every day. We also enjoyed the 3 oversized docks which provided direct sun and lots of fishing! We rented a pontoon boat from the marina and was able to dock it at the home without any problems. Another plus in this home is all of the sliding doors that open completely to the lanai. The home is in a great location, on a cul de sac and close to everything needed. It is also within walking distance to Mackle Park. I would recommend this home to anyone and hope to return next year. We were looking for accommodations that would meet the needs of our family and our budget and this house met both. This is also our first experience in a home rental and everything went very smoothly. The rent agent was great and helped us through the entire process. The house was more then we expected. Clean and well maintained with lots of extra like towels and beach equipment that help keep down the cost. We love to have fun in the sun and the pool, deck and location near the beach made our trip very enjoyable. We woudl recommend teh service and the accommodations to anyone. They were great!!! f you think the pictures do justice to this property, think again, this house is absolutely gorgeous and has space for days! As we headed to Marco Island from Miami, we followed the instructions that were given to us by the kind people at management. We arrived on a weekend so had to pick up the keys at a lot box. Surprise #1: No keys. This house operates on keypads so, no chance of "loosing the keys at the beach". As we arrived to the house, we were met by a great looking cul-de-sac. When we walked in, it was everything you expect a vacation home to be: nicely cooled and impeccable. Everybody started walking around the house checking the rooms out. All of them fairly big and incredible well equipped: Big flat screen TVs (in all except one room), plush king size beds and plenty of storage room. This house holds no bars when it comes to technology: It has high speed internet, wireless router, a SONOS sound system (which for those of you who don't know, it allows you to stream music via wireless) and that's just the beginning of it. Surprise #2: As soon as you walk into the house, you're greeted by a $4,000 massage chair that puts any massage parlor to shame. The kitchen is big and comes with everything needed to cook just about anything you'd like. Plenty of cookware, silverware and dinnerware. The range is gas-fueled which was a nice surprise #3 for us (down in Miami is hard to get gas lines in residential areas). The outdoor area is pretty amazing and probably the highlight of the property. The lanai is big and was a great place to have our dinners. As you come close the outside door, you hear the water splashing down as the "vanishing edge" on the pool operates. It's a sight to see. The water flows down from the attached spa into the pool and from the pool to a reservoir below. Right down from it is the deck. As massive as you can get. Enough space to dock 2 boats and a couple of jet skis and plenty of lawn-chairs to sun bathe. There's also a grill by the pool in case burgers and hot dogs are on the menu. We didn't do much shopping or took a walk around town, mainly went to South Marco and Tigertail beach (we liked South Marco Beach a bit more but it's hard to get parking since it's a very small public lot), then again, when you stay at a place like this you don't feel the need to leave much. If you're on the market for a relaxing vacation at a hotel-like home, look no further, this house has everything you need and then some. We vacationed on Marco Island over spring break. We vacationed on Marco Island over spring break and could not have found a better place to stay. We have two teenage boys and everyone had their own room with a King size bed. The place was very clean and the property was spectacular. We could not get my husband to leave. The pool was not screened in and we loved it. This place really made our vacation. The property is well kept and well stocked. No complaints. Highly recommend. We are very picky and have high standards. You can't go wrong renting this house. It is ever better than the pictures. We were very surprised and very happy with our experience. We were three couples who needed three bedrooms & three baths. This house was perfect. The pictures did not do justice to the property. It was beautiful - clean & well maintained . Myself, my husband and our 14 year old son stayed here in July. We had a fabulous stay in this wonderful home. 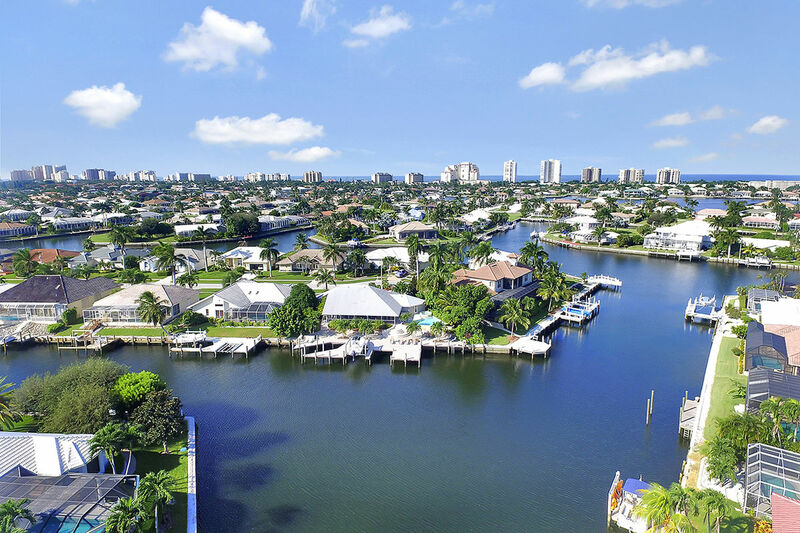 It is very well appointed and is an easy drive from the beaches and numerous restaurants in Marco Island as well as supermarkets if you prefer to eat in. The huge benefit of this property is the amazing outdoor pool and deck area - very quiet, perfect for sunbathing and just chilling out. 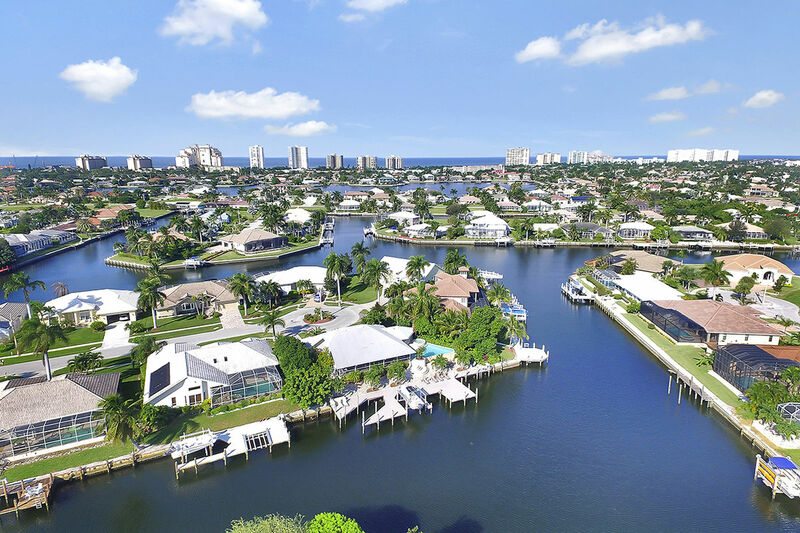 I would highly highly recommend both this property and Marco Island itself, which is just a treat. We have stayed in Naples previously but preferred Marco for its unique culture. We left here to spend a few days at the Warldorf Astoria in Orlando and there was no comparison - Marco wins hands-down! 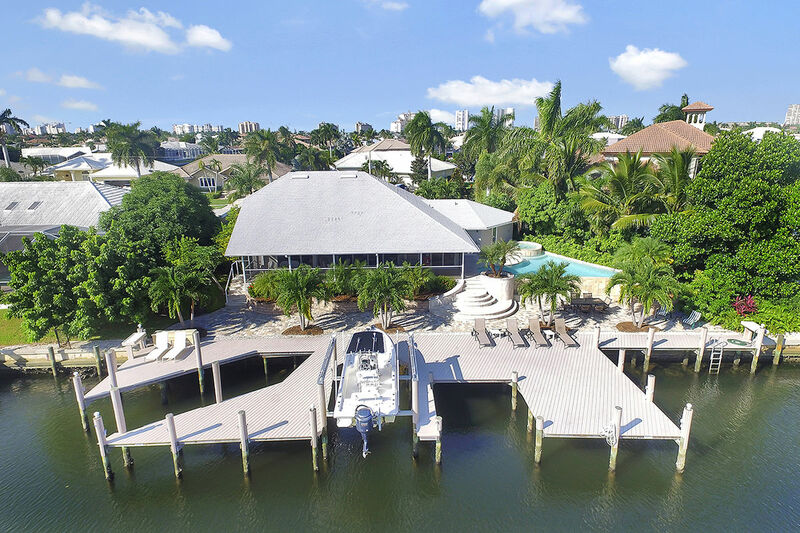 Do take the Dolphin Explorer trip, go to Tigertail beach at sunset and try Verdi's and Marco Prime restaurants, but most of all sit on the deck with a cold drink and be happy you chose this great rental! The pool area and dock were so wonderful at this house. Plenty of room to hang out and lounge and fish and enjoy the weather. The inside was great too. It is laid out almost as 3 master bedrooms and then they all have a very nice bathroom to accompany it. Myself and my two friends were very pleased with everything on this trip. Property is immaculately maintained and the pool is awesome with superb water views. Great location, close to everything but still nice and quiet. We loved it - the owners thought of everything! 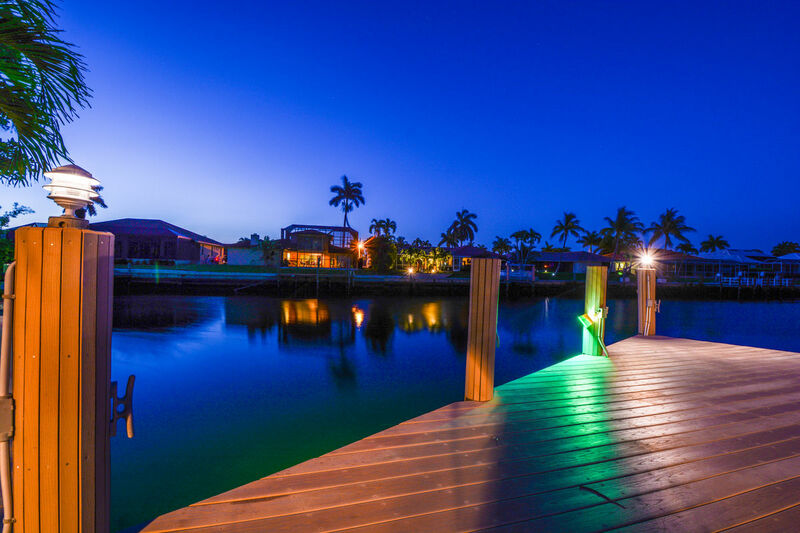 Wonderful place, great location, incredible pool and dock. Nice neighborhood too! Well appointed, 65 inch TVs everywhere and a sweet massage chair too. No expense spared, and this is from a snobby business traveler who has been around the world. If you're considering Marco, stay here vs a hotel (stayed in a few high end ones) and you'll have a better time with less expense. Enjoy! Everything from the reservation to the departure and everything in between was handled with complete professionalism and courtesy. Never had to go to any office to check in. Just walked up, punched in the door code and started enjoying the beautiful house we had rented. The house was completely stocked with everything we could possibly need. More importantly, everything provided was top-notch quality and everything worked perfectly. Beautiful house, beautiful location, awesome pool and hot tub with a view of 2 canals. Completely equipped with a massage chair that was incredible! Plenty of dock and storage for our boat and both Jetski's. We felt very safe and secure at all times. Would strongly recommend & will probably rent again next year!!!! We have been at this location prior and the owners continue to make improvements and updates! 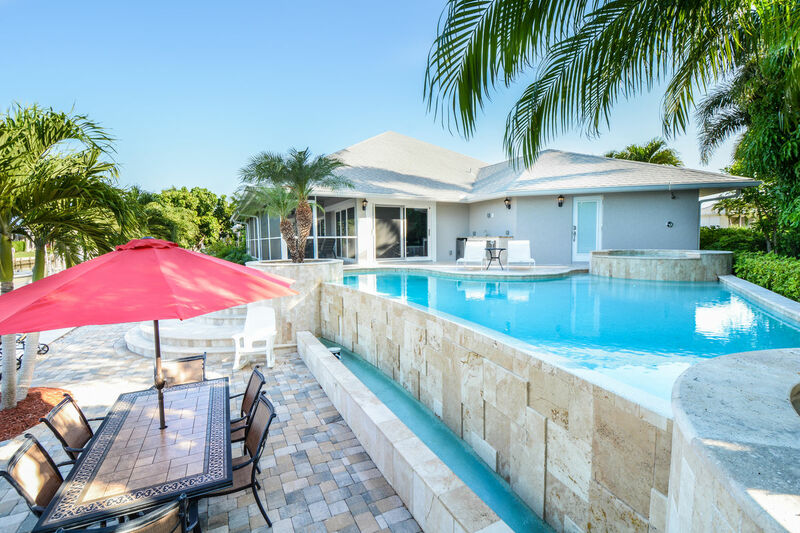 This location has a spectacular heated private infinity pool and hot tub arrangement, accommodated by outdoor fridge/kitchen and shower areas. The pool area is joined to an amazing spacious deck and dock setup to relax at (and fish the canals), along with a large peaceful screened in lanai. All the bedrooms conveniently have their own attached bathrooms along with (king size) memory foam mattresses to peacefully rest up for another day in paradise! If needed the home has a nice washer and drier, extremely fast wifi, central air, comcast tv with multiple big screens, and Sonos speakers connected throughout the house. The owners allow you use their bikes with baskets to explore the island, or head to the nearby beach access, restaurants, shopping, grocery store, etc...! We loved our stay and already have our next stay here booked later this year! The is by far the nicest house we have ever rented on Marco. The unique three master bedroom suites were perfect for the three couples that meet up once a year in Marco. We had a memory foam mattress in our suite which was extremely comfortable. We also loved the sliders out to the lanai from two of the bedrooms. The bathrooms were huge, modern, clean and well-stocked with towels. We cooked in every night and the beautiful, modern kitchen had everything we needed. But the best part of the house was the outdoor living space. The infinity pool was spectacular! Lots of noodles and floating chairs to choose from. We lived in that pool all day and long into the evening hours. The outdoor deck furniture was plentiful and comfortable as was the outdoor dining table for six which was nestled up to the lighted fountain with trickling water coming down the wall from the infinity pool. Inside the lanai were comfortable chairs and a sofa but we honestly did not spend too much time in here. The outdoor living (outside the lanai) is what this property is all about!! The beautiful landscaping and travertine (?) marble made us feel like we were staying at a fine resort. The location was excellent, too, as it was at the end of a cul de sac so it was quiet, yet the house is within walking distance to the beautiful Mackle Park and the awesome Farmer's Market on Wednesdays. Can't wait to return to this bit of paradise! We had another great year at 1074 White Heart Court. The upgrades were noticed, and appreciated. LOVED the Keurig, new patio furniture, fridge on the deck. As always, the house is loaded with everything we needed! The beds are comfortable and top notch! You can't beat the morning view from the lanai - this house fit our family and lifestyle perfectly. We will definitely rent this house again! Thank you!!!!! The house was on the canal and in a quiet neighborhood. The location made it easy to get around the island and enjoy the restaurants and beaches. The house had all the amenities for a pleasant stay. We loved this house and we loved the setting as it views the bayside. The design of the house and the design of the outside spa/infinite pool/dock is outstanding! My husband and I shared the house with my 21 year old daughter and her 3 friends. WE all had plenty of space to lounge and relax outside, either in the pool or the spa or lounging on the dock. During the rain, we used the screened in porch area to sit and play games. The house itself is very comfortable and the kitchen is fully stocked. It was a pleasure to prepare meals in the large beautiful kitchen area. All the bedrooms have king sized beds that were very comfortable and each bedroom had its own bathroom and had its own television. We highly recommend this house for fun times as well as rest and relaxation. 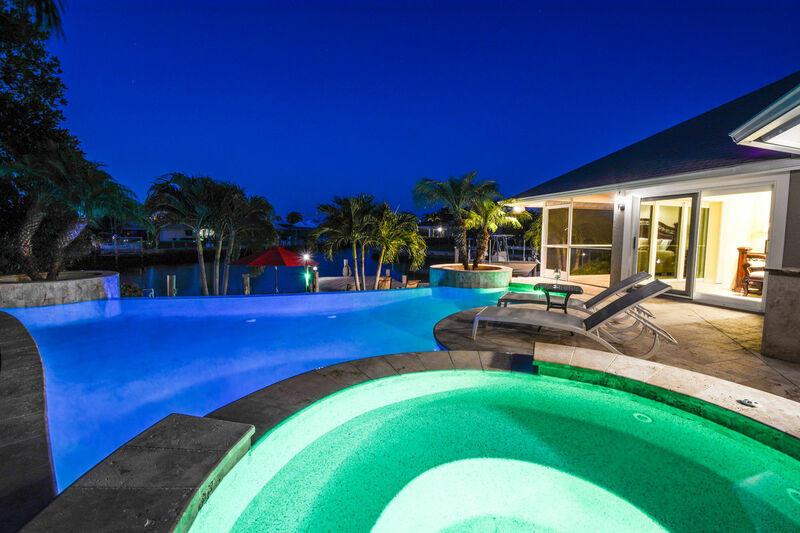 This house on Marco Island was absolutely wonderful. Anything you would need was there for your use. It was extremely well kept & very clean. Loved that there were numerous outdoor spaces you could use if you wanted to be by yourself or just a change of scenery. There was a day or two we didn't even leave the house! The time we were there, only a few of the neighbors were around, so it was very peaceful. We had an extremely enjoyable, relaxing vacation! Loved it!! We loved the house, especially the outdoor space. Having 3 large bedrooms, each with their own bath made it very comfortable for our family. It was clean and conveniently located to the beach, restaurants and stores. We would definitely stay here again. 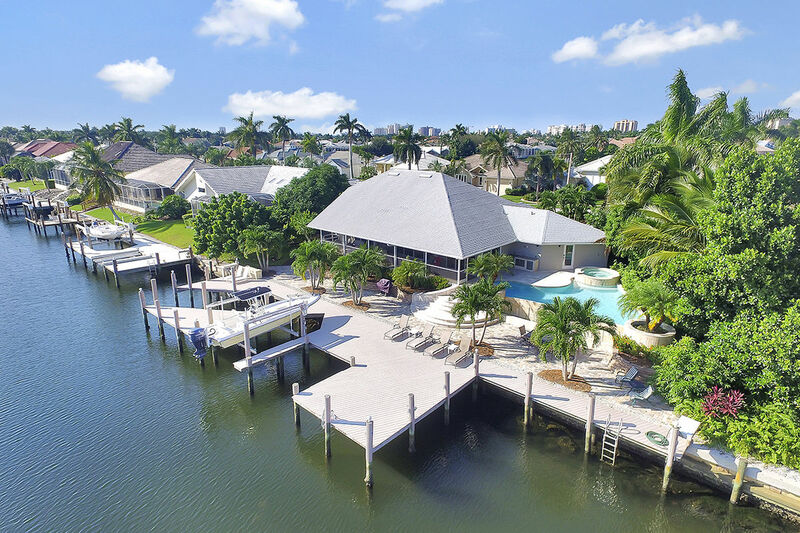 This was our 4th rental of this beautiful home on Marco island and we look forward to a return visit soon. The upgraded amenities made our stay even more pleasant. The new furniture on the lanai and pool deck,the beach towel rack full of towels was a nice touch and even the pots and pans in the kitchen made it a joy to cook at home. The place is always clean and neat which makes it feel like home. This home was a beautiful place to stay. Short drive to local beach with good fishing nearby and off the dock. We loved the infinity pool and view of the canal. Definitely a great place to relax and unwind. This home was beautiful and the views were amazing. Will defiantly be returning! The house was wonderful! The layout great, with 3 suites and the living central. The pool, spa is very serene and secluded even though there are other houses nearby. The kitchen has everything you can ever think you might need. We cooked most meals at the house. Thanks for a great, very relaxing week. 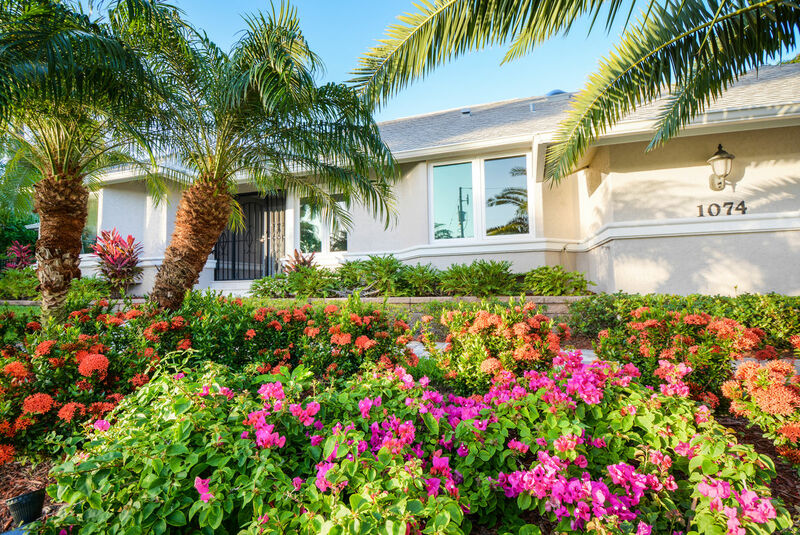 We loved staying at this beautiful home on Marco Island. Everything was so special. 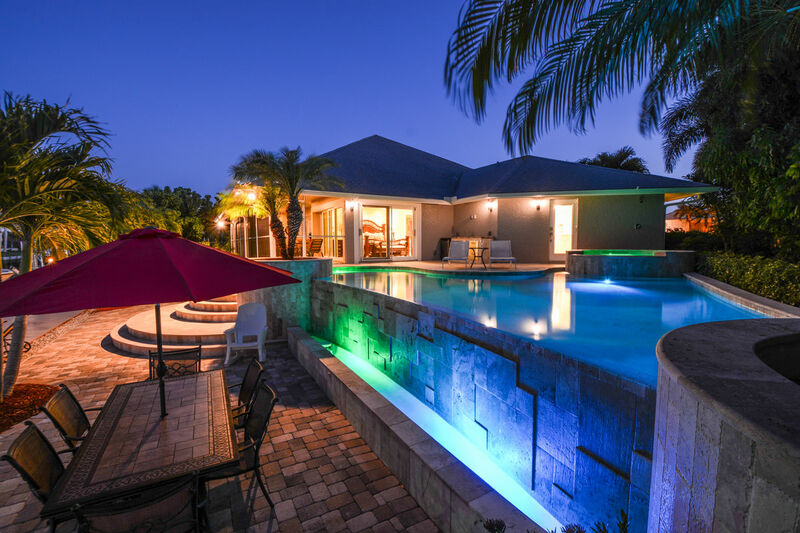 The large back yard offered a gorgeous infinity pool, and hot tub overlooking the canal. There was plenty of seating and many options for shade or sun relaxing. This property was landscaped with privacy in mind. Huge lanai with great views of the water ways and pool. The entire home was beautifully furnished and very clean with new upgraded appliances. Truely a gorgeous setting for a wonderful and relaxing vacation. Thank you.